On a recent snow day a group of us got together to share some brews. We enjoyed some great food, sampled a fantastic home brew (Ruination clone), and got after some tastings. Everyone brought something to share: my contribution was a bottle of Russian River’s Supplication Ale. Most brewheads know and love this Santa Rosa, California-based outfit for their coveted Pliny the Elder, a stalwart Double/Imperial IPA bursting with citrus hops. Pliny the Elder this beer ain’t. 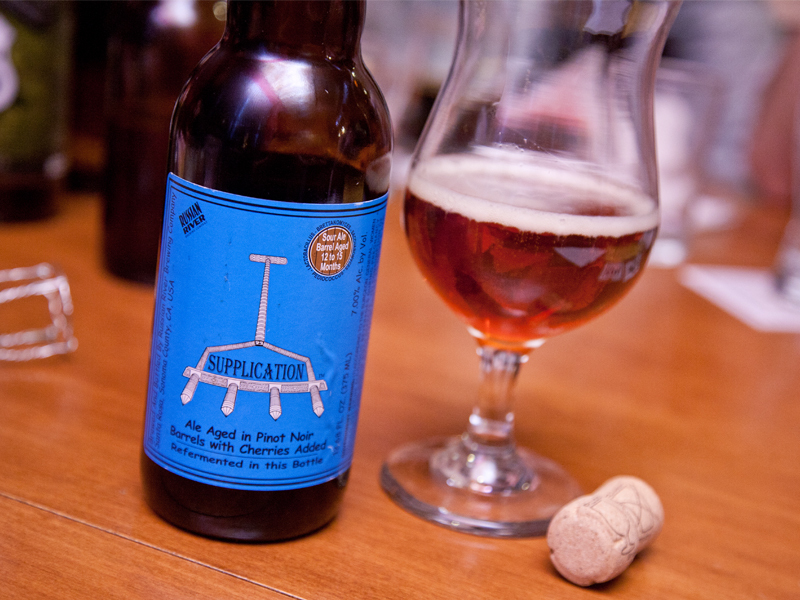 Supplication is a seasonal ale, a Brown Ale aged in French oak Pinot Noir barrels, with sour cherries, and bombed with three strains of wild yeast: Brettanomyces, Lactobacillus, Pediococcus. That should be enough of an introduction for most people who understand beer to approach this beer delicately. But excitedly, big big! Because beers like this, though they might seem formidable, are special. The nature of their ingredients means they’re much harder to master. And let me tell you, Russian River have absolutely mastered Supplication. It is an incredible beer. It comes in a 375mL bottle that’s nice and heavy: dark brown glass, cork, and familiar blue label. Poured into a clean tulip glass with great care (don’t want to stir up sediment), the beer appears a beautiful reddish orange hue and gathers some nice carbonation. Its aroma is quite clean and fruity compared to the more musty barnyardy aromas you get in beers with these yeasts: grape, cherry, and dark fruits lurking in there, and there’s a tartness to the nose that really makes the palate water. The taste is amazing: so absolutely delicious and surprising, your palate will reel from all the complexity in this beer. Bready malt, tart fruit, hop bitterness, and wild yeast combine in such a great ratio. This beer is nuance through and through. Here in Chicago, Russian River is impossible to buy. We must either enjoy it as a gift from Westerly friends, have to travel out to the west coast ourselves, or trade for it on the beer wire. I highly recommend you get your hands on some. There’s a reason it is one of the highest rated American-brewed ales.